Doug rode his bike off the roof and Kayleen can’t stop throwing up. As they mature from accident-prone kids to self-destructive adults, their broken hearts and broken bones draw them ever closer. These two rebels may only be fit for one another. But how far can one person go to heal another’s wounds? In "Gruesome Playground Injuries," the damage goes far deeper than skin and cartilage. Rajiv Joseph's romantic dramedy, offered up with an appealing vivacity by Woolly Mammoth Theatre, wrestles with the problem of a young man and woman who struggle vainly over the decades to wrap each other in a blanket of love and protection. Recounted as a series of vignettes that hopscotch back and forth across time, the story of Doug (Tim Getman) and Kayleen (Gabriela Fernandez-Coffey) unfolds around their respective affinities for mishap. Doug, oblivious to danger -- and a little bit of a masochist -- repeatedly winds up in school nurses' offices and intensive care units. Kayleen, meanwhile, is susceptible to more psychic distress, revealed in her neurotic episodes of pill popping and self-mutilation. It's the jaunty, quirkily amusing tone Joseph takes with their encounters, from the time Doug and Kayleen are 8 until they're 38, that makes this play more than the sum of its metaphors. Getman's Doug, in particular, successfully advances the comic possibilities, infusing the character with a sweaty boyishness reminiscent of Tom Hanks in "Big." His manic displays around Fernandez-Coffey's troubled Kayleen help you to understand her deep ambivalence about Doug, even though he probably represents her best hope for happiness. Director John Vreeke effectively embraces the story's crosscurrents, drawing out the play's youthful exuberance as well as its sadder dimension -- the sense that even when two people can be each other's salvation, there's no guarantee that they'll ever reach the kind of emotional synchronicity that allows them to carry out the rescue. Still, you find yourself wishing that a few more of the expository blanks had been filled in. Maybe that's because Joseph, author of "Bengal Tiger at the Baghdad Zoo," a finalist for this year's Pulitzer Prize for drama, has developed characters in "Gruesome Playground Injuries" of such rich dramatic potential, and ambiguous connection. Doug and Kayleen are best friends of a special intimacy, although their romantic history is unclear: One of the scenes that could use a little more foundation has the 18-year-old Doug visiting Kayleen in her bedroom, jumping nonchalantly on top of her and being summarily dismissed from the bed. In the latter portions of the play, Doug and Kayleen meet only about once every five years, and yet their conversations seem to evolve as if they were daily presences in each other's lives. Yes, with some unusual friendships, we do pick up where we left off, but the interests of drama are better served when we have a clearer understanding of why people go away and come back. Even so, we do at some instinctive level believe in the bond between Doug and Kayleen, and that has to do with the authenticity of their pain. We never doubt their innate, almost mystical, compassion for what the other has endured. The arresting set by Misha Kachman reinforces a conceit of the piece: that life plays out in a bruising arena. The seating arrangement is in-the-round, with Kachman's evocation of a dilapidated ice rink filling the central performance area. 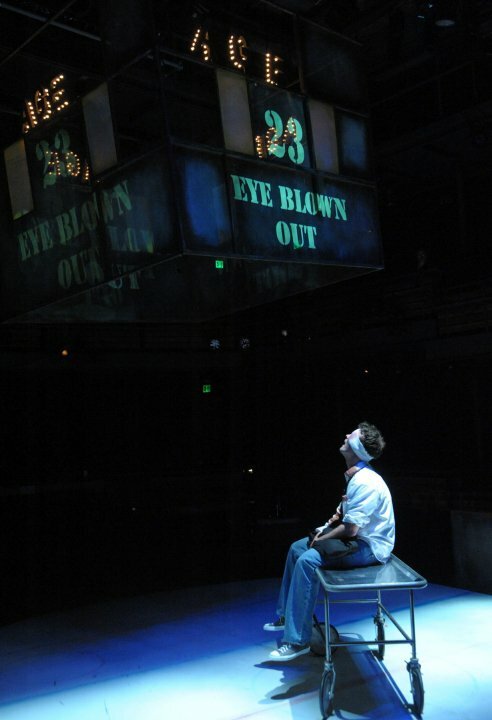 Overhead, the designer suspends a broken scoreboard, which keeps track of the various ages at which the characters meet, and at the edges of the stage are cabinets and mirrors the actors use for costume changes. Music by contemporary artists such as I'm From Barcelona and Ludo fills the scene transitions, though the soundscape does not correspond chronologically to the events of the show. Getman and Fernandez-Coffey ably mature and regress with Doug and Kayleen, helping the play's puzzle pieces interlock with charm and vigor. We always hurt the ones we love. Unless we’re carrying around something more than the baseline quotient of 21st-century crazy, in which case we hurt ourselves to summon the intermittent attentions of the ones we love. That’s the sad condition in which the two perpetual victims of Rajiv Joseph’s Gruesome Playground Injuries find themselves, or search for themselves. Joseph’s unsentimental, non-linear anti-romance checks in with Kayleen (Gabriela Fernandez-Coffey) and Doug (Tim Getman) at five-year intervals between the ages of eight and 38, each encounter precipitated by some calamity, usually bodily. If it feels like a bit of a cheat that these friends connect only on the occasion of each other’s misfortunes, Getman and Fernandez-Coffey deflect that objection with the conviction of their performances. Getman never lets his oozing ensemble of bandages and slasher-film makeup do the work for him, and Fernandez-Coffey subverts her considerable beauty to register as even less emotionally autarkic than he. One of the great pleasures of John Vreeke’s production is the scene-transitions, wherein the actors revel in the physical agility denied their characters, gliding and stomping through costume and set changes while nicely curated if occasionally on-the-nose indie barn-burners, raps, and ballads blare. (The performers also convincingly conjure the physicality of children versus adolescents versus very tired adults.) These segues linger long enough to invite suspicion Vreeke is leaning too heavily on the increasingly dour songs to dial up an emotional palette, but nothing in the ensuing scenes ever feels unearned. It would be intriguing to see Joseph continue his examination into his characters’ geriatric years—while these two may arguably endure a lifetime of pain in the three decades we’re shown, and there is an ending of sorts, does Joseph believe life ends at forty? Or that only bitterness replaces the optimism of youth? Still, there’s something paradoxically life-affirming about the sensitivity with which playwright and players perform this haunting ode to self-destruction. 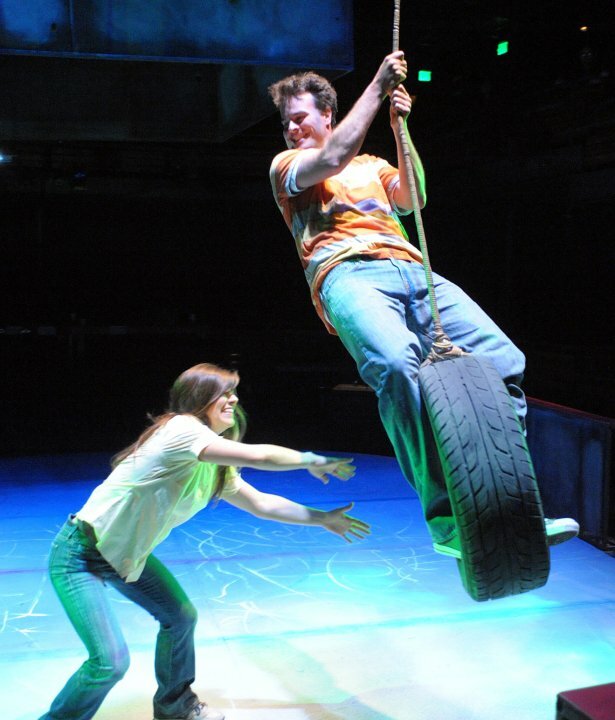 Woolly Mammoth’s production of Gruesome Playground Injuries cuts deep with effective performances and staging. Schoolyard scrapes and bruises make way for messier grownup wounds in Woolly Mammoth Theatre Company’s Gruesome Playground Injuries by Rajiv Joseph. A beautifully crafted production, Injuries is layered with quirky humor and poignant intensity—a crash course in growing up, getting hurt, and the healing power of love. When eight-year-old Doug takes an Evel Knievel-inspired bike ride off the elementary-school roof, he lands in the nurse’s office with a split cheek and a vomiting classmate, Kayleen, on the next cot. 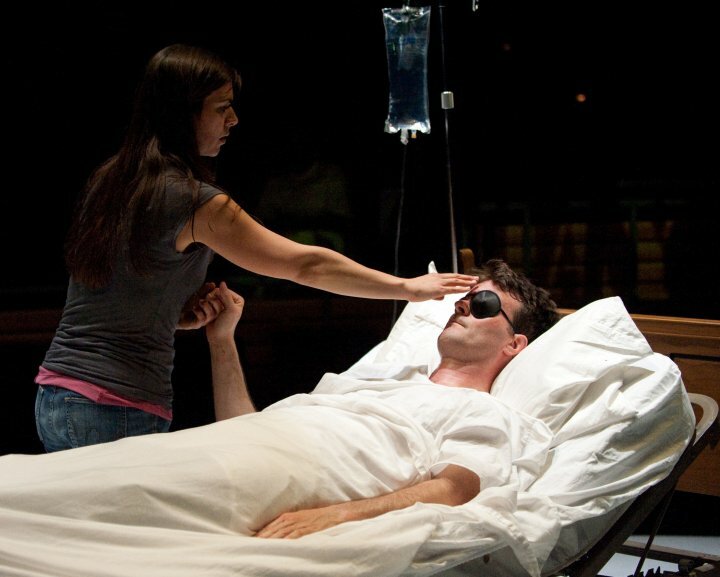 The pair—played by adult actors Tim Getman and Gabriela Fernández-Coffey—make up the entire cast in the 90-minute show, which follows the accident-prone duo’s evolving relationship from nurse’s office to troubled adulthood in charmingly out-of-order sequence (a scoreboard-like set piece helps keep ages straight). With only two characters and an intimate theater-in-the-round space, the pressure is on Getman and Fernández-Coffey to carry their dramatic weight, and for the most part both deliver. You can feel Getman’s energy as the danger-happy Doug, and he channels that passion into more dramatic scenes with ease. Fernández-Coffey’s take on the self-destructive Kayleen is a little bumpier, but by the end her complex character has filled out nicely. The leaps from ages 8 to 38 to 23 to 13 and several ages in between give the show a fresh edge and relatable honesty. But at times, especially when playing younger, the actors push too hard for almost stereotypical portrayals. Yes, 13-year-olds think gross-out humor is funny, and 23-year-olds still have some maturing to do, but in the theater’s close quarters, a little more nuance could go a long way in some scenes. The dazzling staging by director John Vreeke does its own storytelling. The set by Misha Kachman whirls and twirls in time with the unexpectedly powerful indie soundtrack (the sound design is by Christopher Blaine). Costume and makeup changes—there are a lot of black eyes and gaping cuts—take place in plain sight, with a ballet-like rhythm and palpable emotion. Revealing those normally back stage transitions makes for a simple but moving display of passing time and building feelings. Gruesome Playground Injuries—not appropriate for kids, by the way—captures both carefree childhood innocence and the kind of pain that needs more than a Band-Aid. 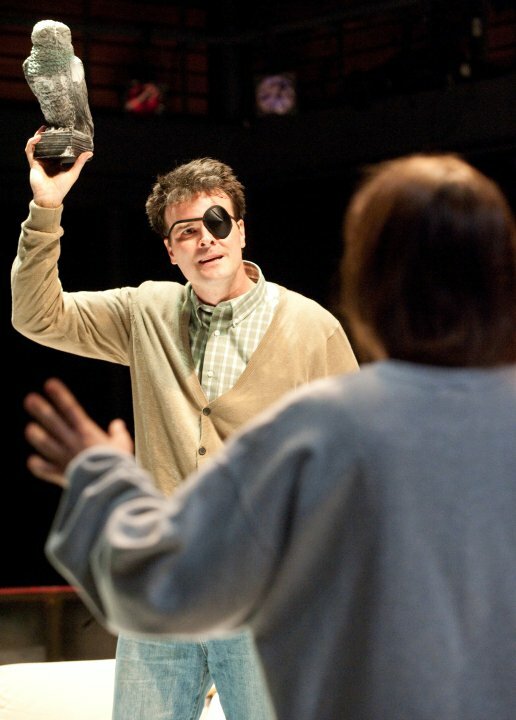 Even by Woolly Mammoth standards, Rajiv Joseph’s Gruesome Playground Injuries is a strange little play. A potent mixture of the hapless and tragic, Gruesome has you chortling at poked-out eyes and busted teeth, and swallowing back tears at the cosmic unfairness of soulmates who are perennial victims of mismatched timing. Director John Vreeke exhibits an affinity for the madcap and melancholy aspects of Mr. Joseph’s play, which is receiving an oddly life-affirming production at Woolly Mammoth. The premise takes the cliché “you always hurt the one you love” to almost absurd extremes, as friends Kayleen (Gabriela Fernandez-Coffey) and Doug (Tim Getman) first meet at age 8 in their Catholic school nurse’s office—she has a dodgy stomach, he ripped his face open playing Evel Knievel on the roof—and then leap between 30 years of memories and meetings in emergency rooms and medical wards. Doug is a daredevil jock with a bit of a death wish; Kayleen’s injuries are more internal and crushing to the soul. They both have a talent for mishaps, which both binds them and keeps them apart. He believes she’s his healing angel; she believes he’s the only person who really sees the psychic shrapnel tearing her up inside. This may not sound like something that would have you ripping your stitches with laughter, but the ironically happy-go-lucky tone of the play makes it buoyant rather than bogged down in meaning. Their almost mystical affinity echoes through the years as the characters move between becoming wounded adults and going back to the resilient, alive children they once were. 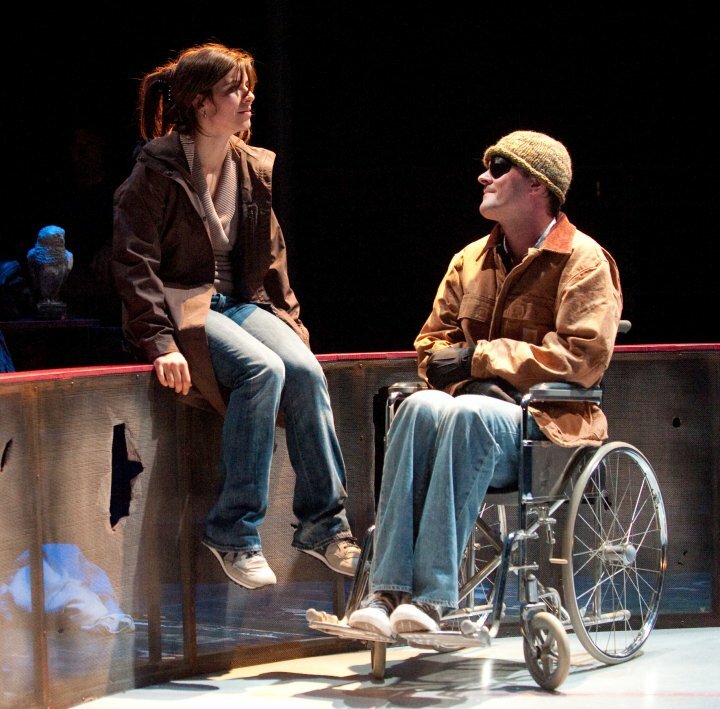 Their relationship is played out in a set by Misha Kachman that affirms the notion that life is not only a game, but one where you will likely get hurt—a rundown hockey rink with the audience in the round, playing the arena’s spectators. The play’s scenes and time changes are projected on a broken scoreboard and the actors execute quick changes at dressers and gym lockers scattered around the rink. The actors are entirely convincing as the younger selves, with Mr. Getman’s open-armed exuberance (even sprained ankles and missing eyes can’t keep him down for long) bouncing off of Miss Fernandez-Coffey’s protective armor of sarcasm and scoffing. Mr. Getman’s boyishness is endearing, even more so when you see him at the end of the play, his appetite for thrill-seeking finally quelled as he navigates toward middle age in a broken body. Miss Fernandez-Coffey’s Kayleen is more prickly and complex, seeming to internalize the bumps and bruises suffered by her friend. While the play’s quirky humor invigorates, it is the undercurrent of yearning that takes the play beyond a litany of injuries endured by two self-destructive people. It’s sad that Kayleen can only speak honestly about her feelings while Doug is in a coma. Even sadder is knowing that pain—not love—is their deepest connection. "Don't let anyone tell you that theatre is about 'storytelling.' When we want a story, we read Homer, or the Bible, or a great novel. Even movies — which jump instantly from place to place — tell stories more easily than theatre. Theatre is about something else: vicarious experience, or the chance to experience life from inside the skin of other people. The characters are live human beings in the same room as us, which makes the transfer of feelings quite direct. Story (or "plot") certainly contributes, but its purpose in the theatre is merely to buffet the characters around so they build up their inner emotions to the point where we can experience them too -- together with our fellow audience members. At the tail end of a season that has focused on big social and political issues — women and war in Eclipsed, communism and capitalism in Full Circle, economic collapse in The Last Cargo Cult, and race and gentrification in Clybourne Park — it's refreshing to return to such personal terrain. Looking back, however, Gruesome Playground Injuries threads a question through the entire season. What responsibility do we bear toward others? Whether the warzone is an ethnic conflict, an economic upheaval, or the nurse's office at school, human beings are constantly placed in situations where we must choose between protecting ourselves and helping others. How we respond is the test of our humanity, and perhaps our survival."